The lack of female GOP lawmakers isn’t confined to Texas. There has been a steady decline overall in the number of Republican women elected to serve in legislatures across the country and in Congress. What stands out in the current makeup of the Texas Legislature, lawmakers and political operatives say, is that after an election year in which voters likely saw more women on the ballot than usual, only one party saw major gains in female representation. Several political operatives and former and current lawmakers chalk up the partisan gender gap at the Capitol to a number of factors: a lack of influential conservative organizations to support would-be candidates, a greater emphasis in the Republican party on recruiting candidates based on experience over gender and intraparty politics that lead some Republicans to alienate people — especially women — with more moderate views. “In my last session … I felt like I had to make votes based on my party affiliation and not what felt right in my heart of hearts,” said Patricia Harless, a Republican from Spring who stepped down from her House seat after the 2015 legislative session. “At that point, if I can’t be true to myself and do what I think is right, then I don’t need to be there. Despite Republican women’s modest numbers, the party still holds a considerable majority in both chambers. But, as Austin-based Republican consultant Adryana Aldeen points out, “the party can grow” when it comes to getting more women, Hispanics and millennials to run for office. The gender skew of politics extends far beyond the state Legislature. At the national level, news outlets are pouncing on the gender disparity in Congress. Earlier this year, West Virginia’s Carol Miller was the only Republican freshman woman to enter the 435-member House, joining an already small group of 12 female GOP lawmakers. In the U.S. Senate, Marsha Blackburn of Tennessee was the only female freshman Republican to enter the 100-member body. Anne Moses, the president and founder of Ignite, a group focused on getting more women to run for office, said that after the 2016 election, there were three Democratic women in Congress for every Republican woman. After the 2018 election, the ratio jumped to 5-to-1, Moses said. In the Texas Legislature, Republican men are more than aware of the need for more gender diversity in their ranks. “We need female candidates in the Republican Party more than ever before,” House Speaker Dennis Bonnen said during a speech Wednesday to the Texas Young Republicans that largely emphasized the need for Republicans to increase its appeal to women voters. But several current and former female lawmakers praised those in power for vaulting GOP women into chair positions. In the Senate, Lt. Gov. 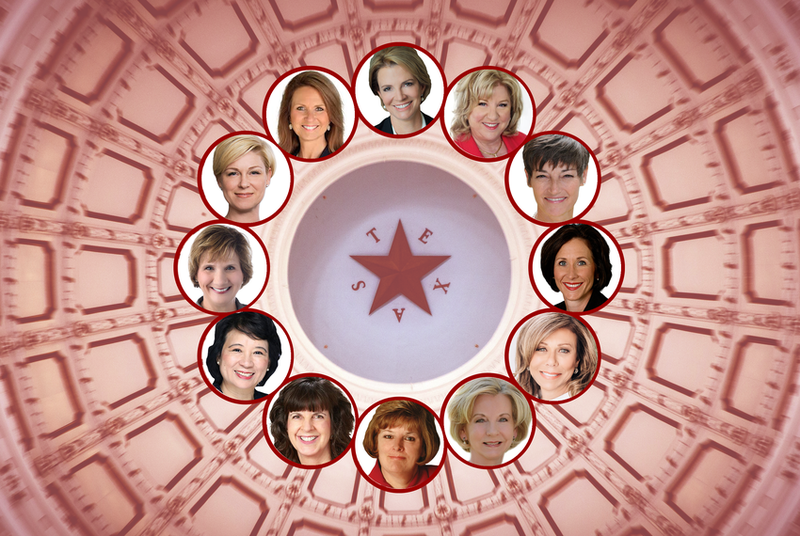 Dan Patrick tapped each of the five returning female senators to lead committees. In the House, Bonnen appointed three of the five returning GOP women — Stephanie Klick of Fort Worth, Angie Chen Button of Richardson and Morrison — as committee chairs. State Rep. John Zerwas also named Sarah Davis of West University Place the chair of a House budget subcommittee. Even the two freshmen will have sway inside the Capitol: Paxton earned a coveted spot as vice chair of the Senate’s property tax committee, which will shepherd this session’s priority legislation. Noble, meanwhile, was selected to serve on the policy committee for the the Texas House Republican Caucus. Neither returned requests for comment. And looking ahead to what’s expected to be a blockbuster 2020 election, many Republicans see a prime opportunity to increase the clout of GOP women. “We need to do a good job of recruiting for the 12 Republican seats we lost and find 12 good, strong ladies with conservative values to run in those seats,” Springer said. Republican men, too, are talking about the need to have more women serve in the Legislature. Even Democrats are hoping more women will be serving in the Capitol come 2020 — regardless of party. Klick said that getting more conservative female voices in the room starts with Republicans simply asking well-known, respected community leaders to consider careers in politics. The Fort Worth representative added that she would “like to see more women running and being successful but in our side of the aisle.” But she’s staying optimistic and said the low number of GOP women serving can be an opportunity for those in the Capitol to have their voices magnified.